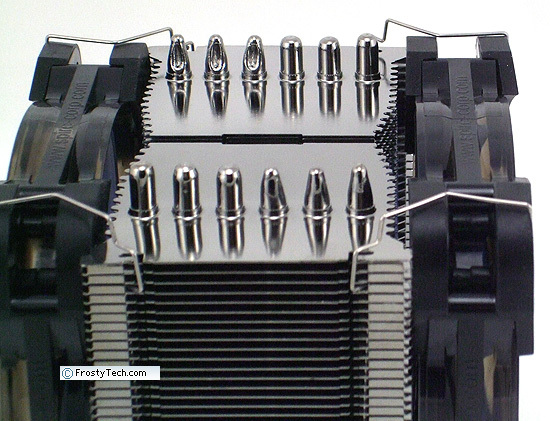 Abstract: Bearing close resemblance to the Prolimatech Megahalems Frostytech tested a few years back, the Eclipse IV heatsink is a bifurcated-tower cooler from heatsink manufacturer 'X2 Products' a brand offshoot of Spire Corp. The Eclipse IV heatsink is rated to a maximum cooling capacity of 220W by its makers and at first glance has the gravitas to back that claim up. 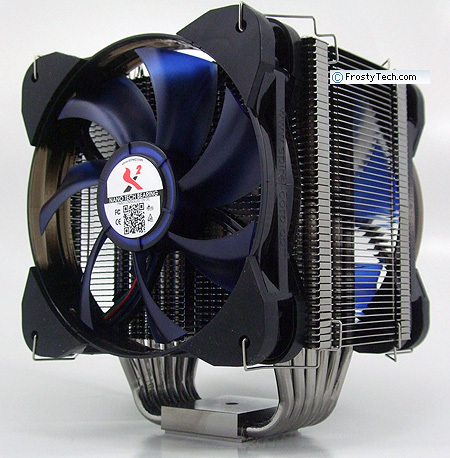 Bearing close resemblance to the Prolimatech Megahalems Frostytech tested a few years back, the Eclipse IV heatsink is a bifurcated-tower cooler from heatsink manufacturer 'X2 Products' a brand offshoot of Spire Corp. The Eclipse IV heatsink is rated to a maximum cooling capacity of 220W by its makers and at first glance has the gravitas to back that claim up. 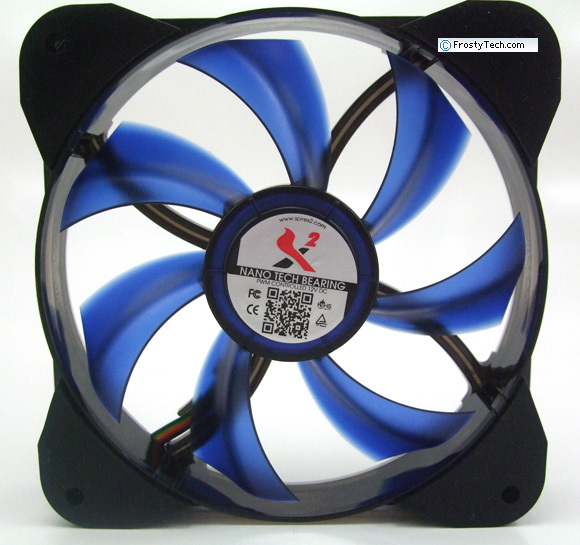 The cooler ships with two 122mm PWM fans mounted in a push-pull configuration, each spinning at 2000-800RPM. The fans use an interesting, wavy impeller blade geometry that we haven't come across before, too bad neither the translucent fan blades or frame are illuminated. Rubberized edge caps ensure the fans don't create unnecessary noise against the metal cooling fins, but what really caught out attention was the lack of fan power cables... more on that in a moment. 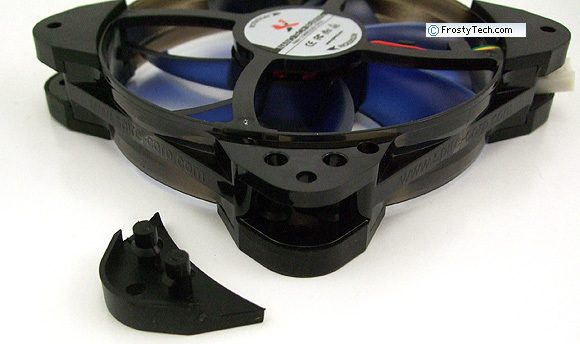 X2 Products' Eclipse IV CPU cooler weighs in at 850grams and stands 160mm tall. It has a relatively boxy, symmetrical footprint measuring 130x126mm. This is a big heatsink, built around six 6mm diameter copper heatpipes and incorporating a copper heatspreader base plate rather than the exposed heatpipe sytle of base. The Eclipse IV heat sink is compatible with Intel socket LGA2011/1366/115x/775 processors and AMD socket AM2/AM3/FM1/FM2 CPUs. Expect the cooler to retail for around $70 USD/CDN. Materials: nickel plated aluminum fins, copper heatpipes, extruded aluminum base block and copper base plate. The translucent blue fans are mounted on the bifurcated cooling tower of the Eclipse IV heatsink so that air is exhausted into the cooling fins and then drawn out from the opposite side. In the image below you can see the wavy translucent blue fan blade geometry. 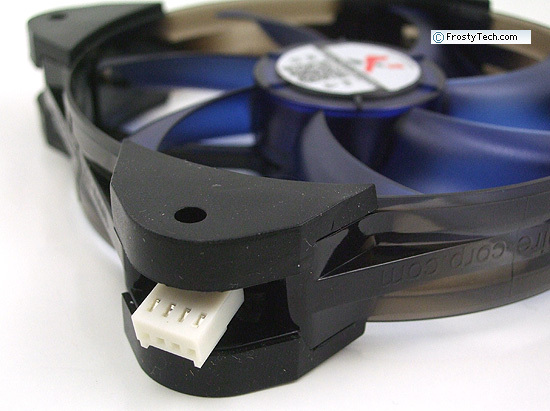 Rather than a 13cm power lead, the 4-pin PWM connector is tucked into one corner of the fan frame like you see above. The idea seems to be to use the supplied PWM Y-splitter to connect both fans to the motherboard fan header. The Y-splitter measures 37cm long, so when you factor in the space between fans, you get about 22cm worth of wire slack to route it to the mobo fan header. 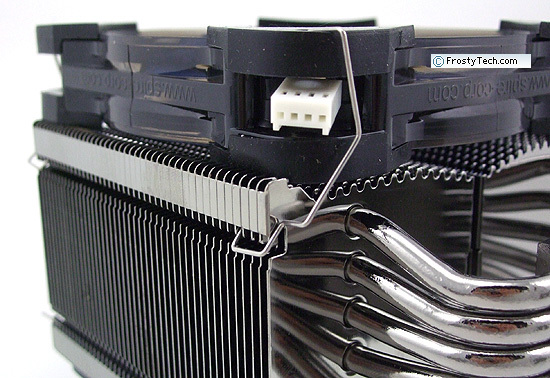 Rubber anti-vibration pads keep the fan frame from rattling against the metal edges of the aluminum cooling fins. The fans are sensibly held in position by springy wire fan clips. In use, we're not a fan of X2 Products' leadless fan style. It's a little awkward to jam the Y-splitter female 4-pin connector into the fans' PWM connector, but more critically, it's difficult to ensure these connectors stay mated. There's no way to get one's finger around the connector to firmly connect the two, nor is there any positive catch to ensure the connectors stay mated. Each time we installed the Eclipse IV onto one of Frostytech's synthetic thermal test platforms, one of the two fan connectors invariably disconnected. In a desktop test scenario this is no great issue, but it's all to easy to snag a cable inside a computer case and loosen the connection partially so the fan looses power. In short. It's a poor design choice and offers no user benefit we can discern. On the upshot, while fan power cables left us head scratching, X2 Products' Eclipse IV heatsink appears to be constructed with a good level of fit and finish. 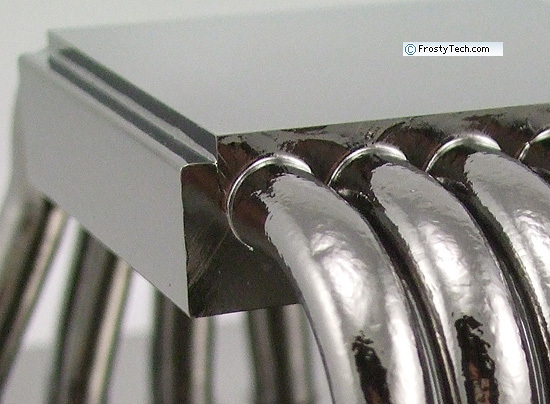 The heatpipe-to-base plate joints are well soldered to ensure good thermal conductivity and the nickel plating will prevent metal oxidation down the road. The heatpipes are swaged into the nickel plated aluminum fins rather than soldered, so in that sense the Megahalems and Eclipse IV are worlds apart. X2 Products' Eclipse IV heatsink is compatible with Intel socket LGA2011/1366/115x/775 and AMD socket AM2/AM3/FM1/FM2 processors. 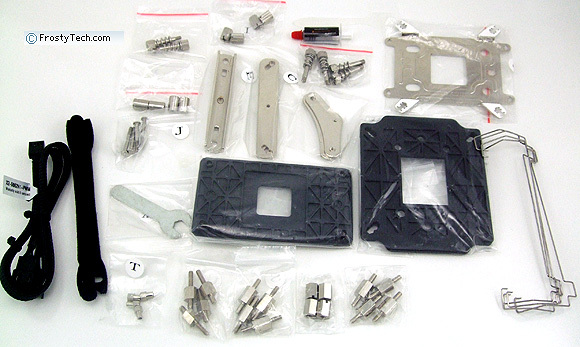 The CPU cooler ships with a bundle of bracket hardware, separated into many small bags. The printed instructions leave a lot to be desired, but on the whole installation of the heatsink onto AMD and Intel platforms isn't too difficult for experienced computer enthusiasts. Clamping force is applied by a fulcrum plate and spring-tensioned collared screws, so in that respect the manufacturer got things absolutely correct. Some platforms will require a backplate installed behind the motherboard along with the top-side mounting hardware. The assorted hardware is pictured below. The Eclipse IV comes with a small syringe of thermal compound and some velcro zip-ties too. 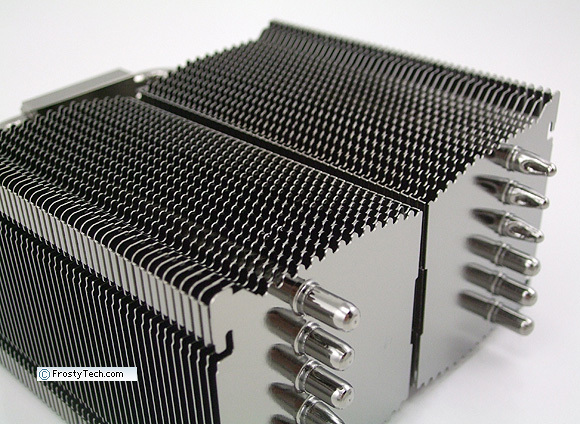 List all X2 Products heat sinks that Frostytech tested?